Ivory towers are so last year. Judging by the list of winners at the 2013 Art Music Awards, winning works and projects are all about connecting with other artists, performing groups, institutions, community organisations - and funding bodies. Lone wolves, bless them, must find it hard. Let's take the Work of the Year awards. Brett Dean's Fire Music (winner of Work of the Year: Orchestral), was inspired by Victorian bushfires, and commissioned for Graeme Murphy's choreography by the Australian Ballet in cooperation with the Royal Stockholm Philharmonic and the BBC Symphony Orchestra, and performed in Sweden and the UK before its Australian premiere. Stephen Leek is another composer whose career is increasingly in the international arena. He arrived at the gala event at NIDA fresh off the plane from Taiwan, and collected the Work of the Year: Vocal/Choral Award for his Songs of Our Journey - a work that had the composer weaving stories by Sydney Children's Choir members into his composition. The composer of the Jazz Work of the Year, Marc Hannaford, smiled to the gala audience via a recorded video greeting from a sparsely furnished room in the United States where the composer-pianist has recently settled, following his winning of the Freedman Jazz fellowship in Australia. Gordon Kerry may have written his winning work (and I'm making assumptions here) on his isolated hill in rural Victoria, but its triumphant passage through Australian concert halls was made possible by a major arts organisation, who commissioned the work and enlisted Kerry as a composer in residence for one season, and a group of touring performers, the Berlin-based Kuss Quartet and violist Naoko Shimizu. 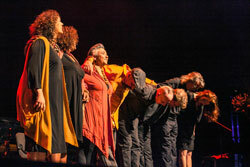 The Performance of the Year Award, too, went to a collaborative project with an international dimension, when the Australian Art Orchestra and the Sruthi Laya Ensemble were recognised for their performance of Sandy Evans's Meetings at the Table of Time. 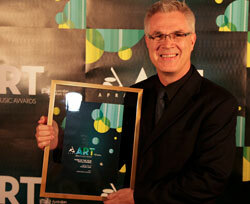 The winner of not one but two national awards (Excellence in Experimental Music and Excellence in a Regional Area) was the Southern Encounter project by Wired Lab and Country Arts SA. Southern Encounter took a steam train laden with sound art across a vast landscape in regional South Australia - a project that depended on collaborations across long distances. Another winner (Excellence in Music Education), New England Sings!, encouraged music making, singing and composition in regional and remote areas by bringing together teachers, students, conductors, accompanists and composers. 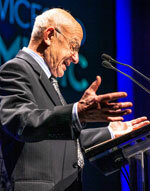 The Award for Excellence by an Organisation was presented to Soundstream: Adelaide New Music Festival for its continued promotion of new music in South Australia and nationally. After Soundstream's pianist Gabriella Smart left the stage, a similarly tireless musician and champion of new music from Queensland, cellist Danielle Bentley, received her Award for Excellence by an Individual. And the Award for Excellence in Jazz went to a third advocate of new music and fellow artists, saxophonist Jamie Oehlers. Two other messages of a serious nature penetrated the hum and buzz of the gala evening. APRA's Sally Howland drew attention to the disappointingly small proportion of Australian works in concert halls and orchestral programs, currently being released by many organisations for their 2014 concert seasons. 'If we start with the premise that our local composers produce outstanding work, and I think we must because that's why we are here tonight, then why is it that in the concert halls around this country we overwhelmingly hear the strains of centuries-old European heritage music? Why is it that in those same concert halls, at a maximum we hear 7% of Australian, locally produced music? What is wrong with this picture? Since we are in a revered theatrical institution, I wonder if our theatre-going counterparts would accept season after season of Shakespeare, thus denying local playwrights the opportunity to tell their stories... or for that matter deny the Australian audiences the chance to see and hear innovative and thought-provoking works, and works that ultmately move us', Howland said. The list of artists who have passed away since the previous get-together was short this year, but a respectful silence followed John Davis's acknowledgment of absent colleagues: Felix Werder (1922-2012), Graeme Bell (1914-2012), Laurie Whiffin (1930-2012) and Brian Brown (1933-2013). 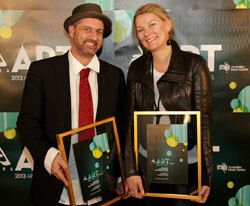 The yearly Art Music Awards themselves are a result of a collaborative effort by the Australian Music Centre and APRA AMCOS. Countless APRA and AMC staff hours were spent processing submissions, organising judging panels, preparing programs, press releases, scripts, and the multimedia presentation - not to mention practical arrangements and staffing for Monday night's ceremony, its program and its presenters. By the time MC James Morrison walked on stage in NIDA's Parade Theatre and the live performance program (put together by recorder virtuoso Genevieve Lacey) began, everyone involved already knew it was going to be a good night. Eleven national awards and seven state awards were presented in Monday's ceremony, to the accompaniment of a Robin Fox laser show, a whole lot of saxophones (improvisation by Sandy Evans, followed by the Nexas Quartet performing a work by Lachlan Skipworth), the gentle sounds of two musical families (the Dreyfuses and the Morrisons), and some earthy soul music from the Black Arm Band. Anni Heino is a Finnish-born journalist and musicologist, web editor and editor of Resonate magazine at the Australian Music Centre. Nice work. I did indeed write my piece on my remote hill, but in the speech that Siobhan Lenihan kindly read when accepting the award on my behalf, I was very aware of the issues you raise. May I take the liberty of printing it here? At times like this I am reminded how much we composers rely on the hard work and goodwill of many, many people. This award is a tribute to them. It was a great honour to be Musica Viva Australia's featured composer last year. Carl Vine and his colleagues have continued the organisation's tradition, now half a century old, of giving new Australian work a national platform and performances by fine international artists. The Kuss Quartet and Naoko Shimizu were unfamiliar with this country and with my work, but coped admirably with the grueling travel, and gave my String Quintet their most professional and detailed attention. Finally, Kim Williams - a composer himself - with generosity funded the commission of this piece.